"Waning of Liberty but Explosion of Grace!" " I am coming on the wings of a cool winter wind, and you will experience explosions in the Spirit in your lives. Explosions of grace that will bring your lost children home. Explosions of My glory that will heal your body in a day, in an hour, in a moment. Angels of fire bringing deliverance in a moment! Angels of Truth, bringing He Who is Truth to your lost relatives, and all the lost. Surprises and more surprises are coming to your doors. But understand this is not a time for letting down your guard, because the enemy will be angered at what I do, since he thinks he has subdued many of you. As I loose more of MY Kingdom, so he will loose more of his. His will be overcome by the Breath of My Glory! So DECLARE what I tell you in your ear! Shout it from the rooftops, declare it in the media. Do not be shy to speak about it publically in the marketplace, and watch how I will stir hearts. I will capture the hearts of the lost with mighty signs and wonders. Worship, worship, worship is the key! Start and end your day with it! Praise ME in ALL CIRCUMSTANCES. You know this, but you need to be reminded when times are hard, and the enemy is throwing all manner of frustrations and barbs, and darts at you. Arise beloveds and DANCE!! Praise Me with all of your heart. And for you who have been so overladen with burdens, ASK for the grace to dance and sing, and I will loose it in you. Ask for anything agreeing and you will see answers. Whenever two or more agree as touching anything, have I not said, IT WILL BE DONE? RESTORATION is coming stronger now. "BREAKTHROUGH" is knocking at your door. 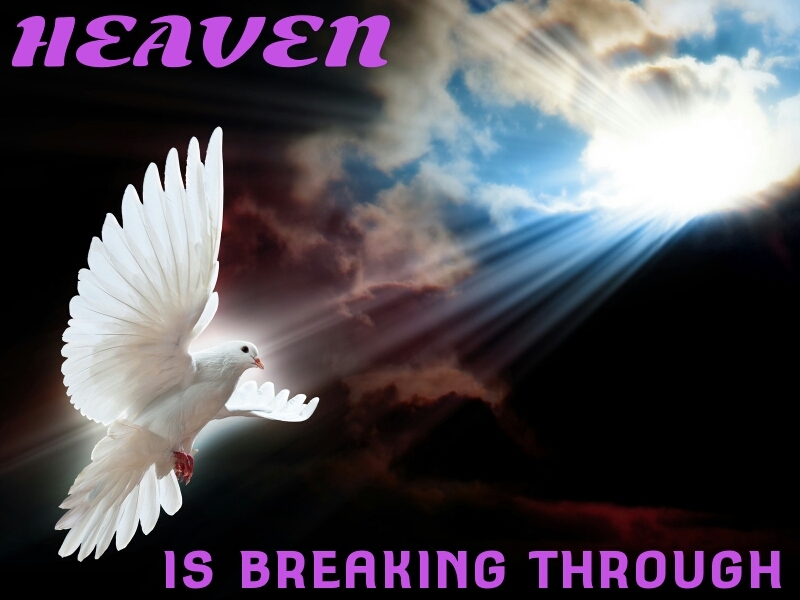 Angels are multiplying as you worship, pray and declare! Go forth with singing in your heart. Put on your armor daily, and talk about Me wherever you go to gather, at the coffee shop, at the market, when walking and talking with friends. Let your conversations be heard, for you are My witnesses are you not? Give your testimony - share what I have done in your life. The seeds of the wicked are sharing their's in the media, and are announcing their intimidations everywhere. It is a time for BOLDNESS. YOU WILL HAVE IT THROUGH MY GRACE IF YOU ASK. DO NOT BOW TO INTIMIDATION TACTICS, BUT USE WISDOM, AS THERE WILL COME TIMES TO QUIET YOURSELF AND BE STEALTH IN YOUR MOVEMENTS, AS THE ENEMY ARISES TO TRY TO CRUSH THIS MOVE OF MINE. There is a time for every season under heaven. A time to be vocal, a time to quiet yourself, a time to share, and a time to withdraw. LISTEN to My voice so that you get the timing right. Do not move presumptuously. Ask me questions, as I am never tired as you are!!! I am here for you always. And I will multiply My signs and wonders as you ARISE and thresh daughter of Zion, and show no shame in worshipping ME. My people will do mighty exploits and many will give their lives in the days ahead. But nothing can touch you till I SAY~! So live your life IN ME. Walk in the Light as I am in the Light."